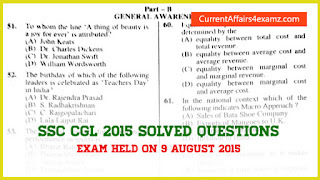 Friends..Here are the solved questions with answer key asked in SSC CGL Tier-1 Exam held on 9 August 2015. All 50 questions were added in Part 1, Part 2 and Part 3 . 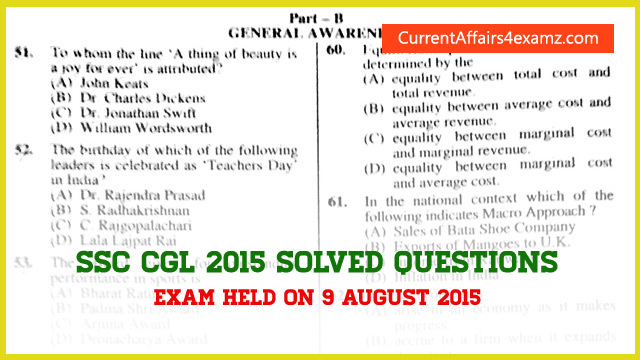 Hope you have checked the question paper of SSC CGL Tier-1 2015 (Morning Shift) with code RK-2015. 1. The legislature in a democratic country can influence public opinion by? 2. If the President wants to resign from his office, he may do so by writing to the? 3. Which of the following is not a Union Territory? 4. The greatest king of the Pratihara dynasty was? 3. In 1939 Subhash Chandra Bose was elected as President of the Congress Party defeating? 4. Jallianwala incident took place at? 5. Who was the founder of Lodhi dynasty? 6. Which one of the following pair is not correctly matched? 7. Gross National Product - Depreciation Allowance=? 8. The Panchayat Samiti remains accountable for its functions to? 9. The legislature gains a priority over the executive in? (A) equality between total cost and total revenue. (B) equality between average cost and average revenue. (C) equality between marginal cost and marginal revenue. (D) equality between marginal cost and average cost. (B) Exports of Mangoes to U.K.
(A) arise in an economy as it makes progress. (B) accrue to a firm when it expands its output. (C) arise when there is expansion in internal trade. (D) arise when there is expansion in an industry. 14. The longest continental Railway in the world is?